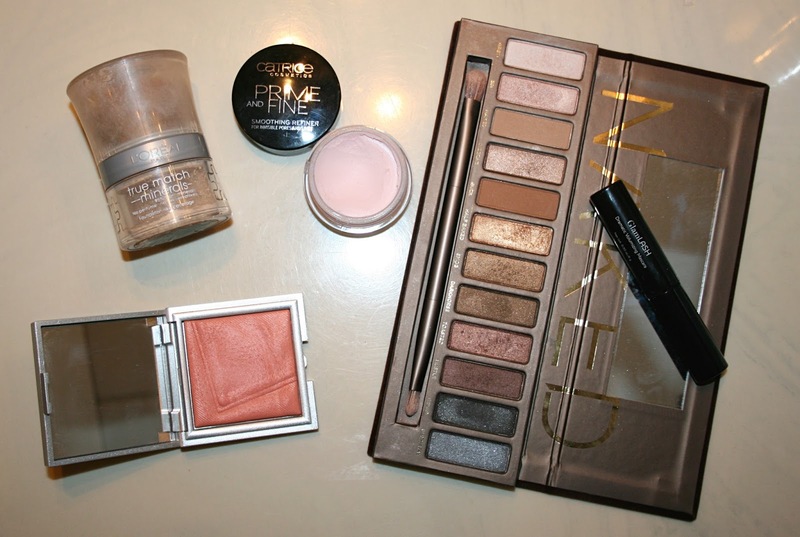 Urban Decay NAKED Palette. Yes, you are all probably thinking, how did you not discover this years ago??? Before I bought this palette, I thought "I have so many good eyeshadows, I don't need this palette." Well.. That changed and I had to have it, since then it's been my favorite palette. It's so versatile and has beautiful and pigmented eyeshadows. Definitely a must-have in everyones makeup collection, even if you are just starting out. For my full review and swatches on this palette, click here. Catrice Prime and Fine Smoothing Refiner. I found this product in December, so it's pretty impressing that it made it to my top five. I have never found as good of a face primer as this one. It totally blurs out your pores and makes your makeup stay on all day! It has that silicone feeling, and before this guy, I never felt like those primers had very good lasting powers, but this primer is so worth it and super inexpensive. KIKO Rock Attraction Blush 05 Sound Coral. In 2009 I bought a different blush from KIKO, they have sadly stopped selling that one, so last year I was looking through the different blushes they sell at KIKO and found that this Rock Attraction Blush is very similar. If you think the Hourglass blushes are a bit too luminous for your liking, this is the blush for you. It still gives your skin a slight glow, the colors are very pigmented and long lasting. I especially loved this coral shade during the summer last year, when my skin was a bit more tanned. Laura Geller GlamLASH Mascara. I got this mascara in a sample set last year and unexpectedly ended up loving it. I'm the type of person that don't normally like mascara right when you open a new tube of it, because it's way to wet. Therefore I open my mascaras, leave them for a few weeks and when I get back to them, they are a bit more dry in the formula and easier for me to work with. This mascara has a dryer formula from the beginning, that way I can start using it right when I get it. It's a great volumizing mascara and if you add a second layer, it's going to make your eyelashes longer too. Sadly my sample size ran out, so I'm definitely getting the full size! Loréal True Match Minerals Powder Foundation. I think I'm cheating a little with this product, since it's a rediscovery and not a completely new product for me, but it deserves to be mentioned. This powder foundation was actually the first foundation I ever tried, when I was about fifteen or sixteen. The thing is, after trying out some amazing liquid foundations, this product got pushed all the way into the back of my drawer, but when I was decluttering my makeup, I found this again and didn't understand why I stopped using it. So it's a rediscovery for me and I love it. It reminds me a lot of the Tarte Amazonian Clay Full Coverage Airbrush Foundation, in the way that it has great coverage, this is though more of a medium coverage, than full, but it's buildable. It's long lasting and I think it's great for people with oily skin. This powder foundation is one of those, that has to sit on your skin for a bit, before it looks good. It's weird, but after having worn it for 30(ish) minutes it looks amazing and the very powdery look is gone, but it's still matte.